Go to a dragon lair with Farkas or Vilkas and kill the dragon. 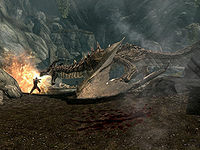 Farkas battles a dragon at Dragontooth Crater. Speak to Farkas or Vilkas about work. Travel to a dragon lair. Talk to Farkas or Vilkas. After completing the quests Glory of the Dead and Dragon Rising, talk to Farkas or Vilkas and tell him that you're here for work. He will tell you that he doesn't believe in dragon stories and wants to see a dragon for himself. He mentions that he heard there is a dragon at a dragon lair. The exact location can be any dragon lair and will be randomly selected. Once you reach the predetermined dragon lair, you will find a leveled dragon. Kill the dragon and then talk to the quest-giver. He will thank you and give you a leveled sum of gold. He will then say he wants to stay for a while and honor it. Farkas' and Vilkas' dialogue for this quest will express uncertainty that the rumors of the existence of dragons are true, even if they have already faced one during an earlier quest. You can start this quest even if you have one of Aela the Huntress quests started you can't turn in Aela's quest though until this one is finished. When reaching the lair, there may be no dragon. Setting the quest to stage 20 using the console will fix this. Vilkas stops following you once you walk outside Jorrvaskr. The quest log indicates that the quest is completed, but the arrow on the map remains until you travel there. Once you arrive at the location of the dragon, the arrow disappears from the map, but the dragon is still there. If you don't go to the location, but instead go back inside to talk to Vilkas and activate the quest again, the quest will now show two dragons. The new one will be in the same location as the first one. The quest will claim to be complete again as soon as you step outside and Vilkas stops following again. ? 10 <Alias=Questgiver> has heard the rumors of dragons and wants to defeat one for himself. I'm going to accompany him to <Alias=Den> to slay the beast there. 20 <Alias=Questgiver> and I killed a dragon at <Alias=Den>. On the PC, it is possible to use the console to advance through the quest by entering setstage CR14 stage, where stage is the number of the stage you wish to complete. It is not possible to un-complete (i.e. go back) quest stages, but it is possible to clear all stages of the quest using resetquest CR14. This page was last modified on 25 January 2017, at 21:38.